One of North Carolina's three signers of the Declaration of Independence. His home is 150 yds. W. Was buried a few yds. 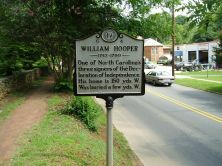 W.
William Hooper, one of North Carolina’s three signers of the Declaration of Independence, was born in Boston on June 17, 1742. He was the eldest child of William Hooper, Sr., rector of Boston’s Trinity Church, and his wife Mary, the daughter of a prominent Boston merchant. At age eight he entered Boston Latin School, the nation’s oldest public academy. Seven years later Hooper entered Harvard University, where he graduated in 1760 with an A. B. and eventually obtained an A. M. three years later. While attending Harvard, Hooper practiced law with James Otis, famed Boston attorney. In 1764, after finishing his education, Hooper moved to Wilmington and opened a law office. Three years later he married Anne Clark, the sister of Thomas Clark, an important New Hanover County politician and future Continental Army colonel. By 1768, Hooper had developed such a legal reputation that he was appointed deputy attorney general for the Salisbury District. Heavily involved in attempting to dispel the Regulator movement, Hooper was dragged through the streets by an angry mob in Hillsborough in September 1770. On January 25, 1773, Hooper represented Campbelton at the General Assembly. He returned to the Assembly in December 1773 as New Hanover County’s representative along with John Ashe. In 1774, Hooper became a founding member of the first Committee of Correspondence formed in North Carolina. On April 26, 1774, he wrote to his friend James Iredell that it would not be long before the colonies “will build an empire on the ruins of Great Britain.” When Boston’s port was closed the following June, Hooper organized two shiploads of provisions to be sent to Massachusetts. 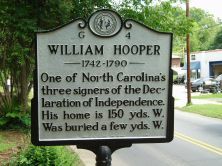 At the First Provincial Congress in North Carolina in August 1774, Hooper was elected as one of the colony’s first three delegates to the Continental Congress along with Richard Caswell and Joseph Hewes. He remained in the Congress when war broke out in April 1775. The following February he left briefly to move his widowed mother from Cambridge, Massachusetts to North Carolina. In May 1776, Hooper joined John Penn and Hewes at the Third Continental Congress. With Hewes, Hooper served on the Marine Committee, and although absent when the Declaration of Independence was voted on, signed his name to the document on August 2. The following December he joined Hewes and Thomas Burke in devising the North Carolina state seal. In April 1777, Hooper resigned from Congress, and was replaced by Cornelius Harnett. He returned to Wilmington, which he represented in the General Assembly from 1777-1781. When the British took Wilmington in January 1781, the family fled to Hillsborough, where they purchased the former residence of General Francis Nash. 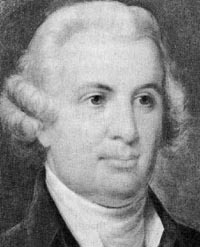 The following year, Hooper’s appointment as Wilmington’s assemblyman was considered invalid on the grounds that he no longer lived there, and in 1783 he was defeated for election as Hillsborough’s representative by Thomas Farmer. After the war, Hooper focused primarily on law, often working in conjunction with his old friend James Iredell. The correspondence between the two illustrates Hooper’s constantly declining state of health, and the heartbreak he felt at not being appointed as a delegate to the Constitutional Convention of 1788 in Hillsborough. Several contemporary accounts illustrate that Hooper drowned his sorrows in rum. Lat in life, Hooper moved to Hillsborough where he died at age forty-eight on October 14, 1790. He left a widow and three children. A 19-foot tall statue at Guilford Courthouse National Military Park memorializes Hooper, whose remains were moved to the park in 1894.